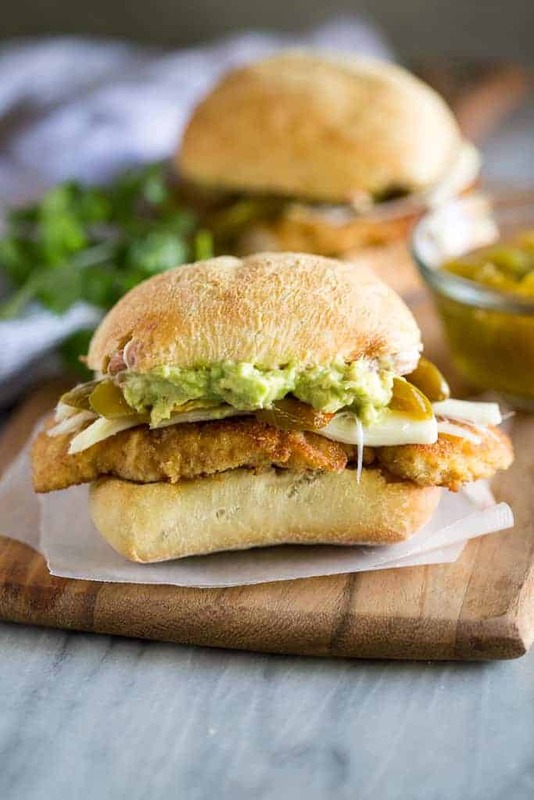 This Mexican Torta or Torta Mexicana is a popular Mexican sandwich with crispy breaded chicken (chicken milanese), cheese, refried beans, guacamole, and pickled peppers. 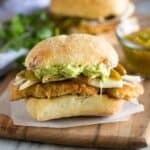 I have so many great and authentic Mexican recipes on my site, but these chicken milanese sandwiches, called “tortas” in Mexico, are definitely at the top of my list of favorites. I like to serve tortas with a side of tortilla chips and the best 5-minute homemade salsa. 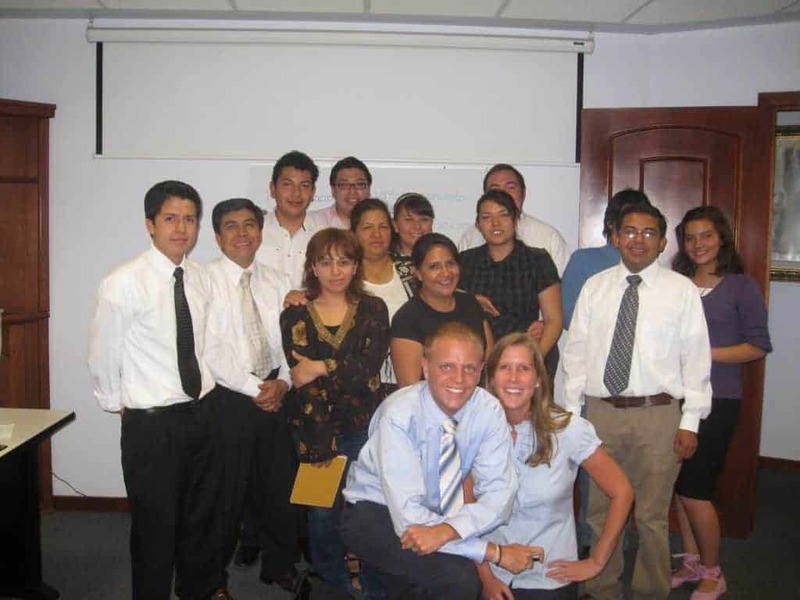 When we were first married my husband and I got to live in Puebla, Mexico for a few months for a college internship. We taught business workshops to people interested in starting a small business and learning how to make a business plan. It was one of the hardest, most rewarding experiences of my life. We made some amazing friends who I seriously miss. I was forced to perfect my Spanish, in order to teach groups as big as 150 students at a time. It was terrifying, but completely rewarding as well. While we lived there you better believe that one of my goals was to master some of my favorite “staple” Mexican dishes, including Authentic Mexican Rice, and homemade tamales. Tortas Mexicanas were a staple in Puebla, and quickly become our favorite sandwich! Torta de Milanesa is probably the most popular sandwich there, and it is FANTASTIC. Like 10 gold stars good. The ingredients are simple but combine them all together and it’s complete magic. It’s not just a good torta Mexicana, it’s seriously one of the best sandwiches on this planet. What is a torta in Mexico? A torta is a sandwich served on a roll or bun. Torta’s can come in many varieties and can be served both hot or cold. Your torta mexicana can be filled with a wide variety of ingredients including different types of meats and cheeses with beans, avocado, peppers, etc. Refried beans: from a can, or you can quickly make your own with a can of pinto beans. Avocado: a good ripe one, mashed. Mozzarella string cheese: In Mexico they use Oaxaca cheese, but string cheese is a great substitute. Thinly breaded, crispy chicken (chicken milanese): made with chicken breast halves, egg and breadcrumbs. Pickled jalapeño peppers: Don’t worry, these are not overly spicy! They can be found in the Mexican aisle at the grocery store. Prepare the chicken. Pound the chicken breast halves until thin. I like to put the chicken between two pieces of plastic wrap, and use a meat mallet or a rolling pin to gently pound it thin. Dip the chicken in beaten egg and then breadcrumbs. Cook the chicken. 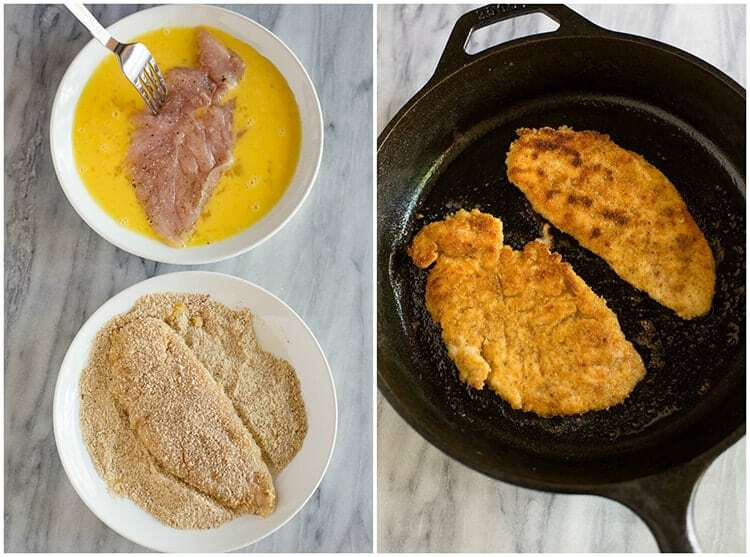 Cook the breaded chicken in a pan with hot oil until lightly browned on both sides, and cooked through. Assemble the torta. Slice the ciabatta roll in half and toast it. 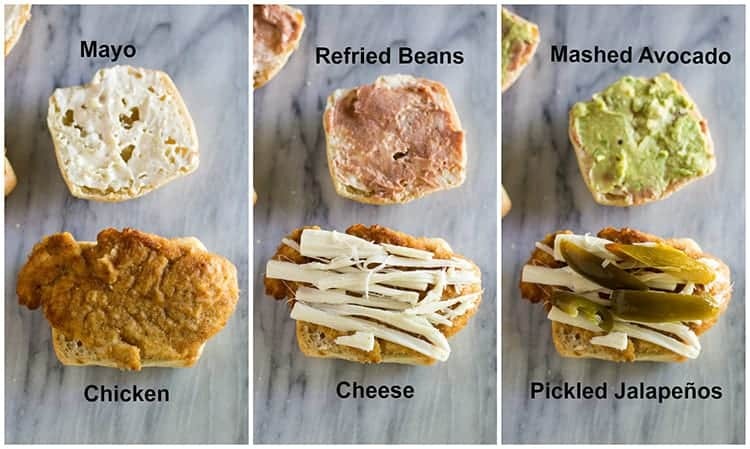 Spread a thin layer of mayonnaise, refried beans, and mashed avocado on the top piece of the roll. Layer the bottom part of the roll with the cooked chicken, cheese and peppers. Sandwich the roll together, and enjoy! This Mexican torta or Torta Mexicana is a popular Mexican sandwich layered with refried beans, guacamole, thinly cut breaded chicken and pickled peppers. Place the chicken breast halves in between plastic wrap and use a meat mallet or rolling pin to gently pound them until thin. Place a skillet over medium-high heat and coat with oil. Add breadcrumbs to a shallow bowl. Add eggs to another shallow bowl and beat well. Dip the chicken in the egg mixture on both sides, and then coat with breadcrumbs on both sides. Place in the pan with the hot oil. Cook for a a few minutes on one side, until browned, then flip and cook on the other side until cooked through. Slice the ciabatta rolls in half and toast them. On the inside top half of the roll, spread a thin layer of mayonnaise, followed by a thin layer of refried beans and then a thin layer of mashed avocado. Top the bottom half of the roll with cooked chicken, a few strings of mozzarella cheese, and a few pickled jalapeños. Sandwich the roll together. Serve immediately. *I make these easy semi-homemade refried beans or you can use canned refried beans. **In Mexico they use Oaxaca cheese, but since that is not as easy to find here, I use mozzarella string cheese, which is really similar in taste and appearance. ***I love the La Costeña Brand of pickled jalapeños. Try them--they are not super spicy (in my opinion), but they add amazing flavor to the sandwich. They can be found in the Mexican aisle at any grocery store. I originally shared this recipe April 2015. Updated April 2019. I love Italian bread and this Mexican twist on a sandwich sounds like the perfect combination! It looks yummy too! I love that you used string cheese on this! That’s so creative!! I might just have to make this sometime. It looks wonderful! This is hands down the BEST sandwich I have ever had! We made it for dinner tonight and are having it for lunch tomorrow! Delicious! The Jalepenos and the bread completely make this meal. I made these tonight for dinner and they were sooo good! I made the semi-homemade refried beans too and couldn’t get enough of them… yum!